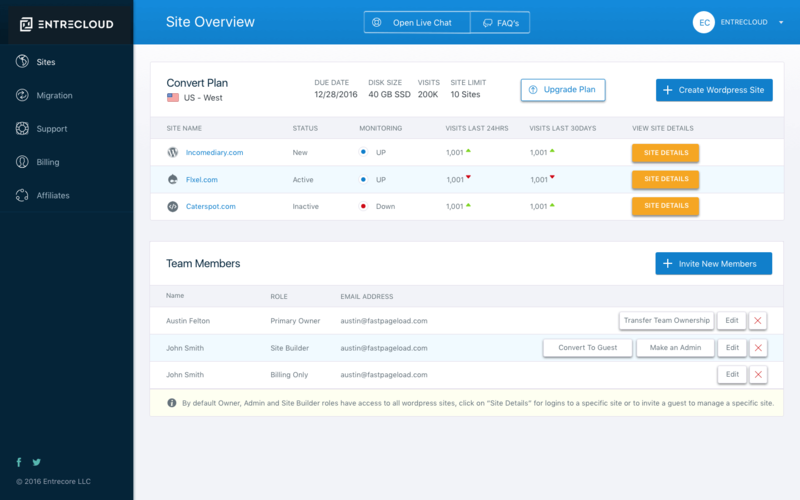 "Austin and the Entrecloud team migrated our sites just days before a really important re-launch. Everything was smooth and our site is now significantly faster (and this typically means an increase in sales). Couldn't ask for a better experience." -> Pain-Free Site Migrations (With No Downtime). Hosting your sites on Bluehost, GoDaddy, or WPEngine? No problem. EntreCloud technicians (real humans!) will move your sites to our platform – with zero cost, zero downtime. -> Create New Sites With One Click. It really doesn’t get any easier. Give us your new domain log-in and we'll create a new optimized WordPress site for you. -> Optimize Speeds & Protect Your Conversion Rates. Conversion rates increase 7% on average for every 1.0-second drop in page load time. We guarantee your pages will load at least 1.0 second faster. And we give you the tools to keep improving loading speeds for all your pages. ->Seamless Publishing & Secure Testing. Never worry about breaking your site again. With Entrecloud, all your editing and testing is done inside of a protected “dev site”. Publish only when you’re ready, with 100% confidence. -> Best-On-The-Web Backups & Data Security. Other hosts tout weekly or monthly backups. If you get hacked, you could lose all your data from the past week... Or more. Unacceptable! ESPECIALLY if you’re running an online business. Your Entrecloud site is backed up on the hour. If something does break, you can quickly restore the last working version. Quickly onboard new team members and developers with appropriate access permissions. See everyone who has access to your sites. Remove access permissions if and when you need to. -> Unlimited Free SSL Certificates. Consider SSL certificates a requirement for each site & domain from now on. (Without one, Google now alerts visitors that your sites is insecure and penalizes your search rankings.) Some hosting platforms expensive and hard-to-install SSL's. With Entrecloud, they're always free and installed with one click. We will move your sites from your old host to your new host for free! All we need is your old login information.